Shoe brand Camper have sent us images of a new temporary store in Berlin designed by the Campana Brothers. 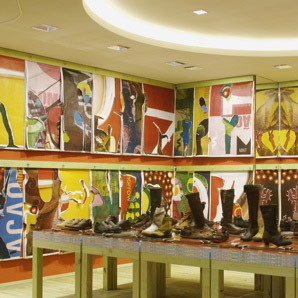 The store, on Ku'Damm, is decorated with the Brazilian designers' Torn Leftovers technique of recycling advertising posters as wall coverings (see sketch, below). Window displays are constructed from straw bales and rough timber pallets. Called "Camper Together with Campana", the store is the latest temporary, experimental collaboration between Camper and leading designers. It follows Camper's recent "together with" collaborations with Jaime Hayon in London and with Alfredo Haberli in Paris. "Torn Leftovers wants to arouse feelings. The concept needed to be strong, but low budget, easy and quick to build. "We cover the walls of the premises with graphics, old advertising hoardings which, out of context, format and scale, acquire a pointillist look and an incoherent beauty. "The giant prints are cut up into random sheets and put on the walls transforming them into scales to be touched by customers: when they are torn off, the sheets reveal their textures, colours and shades. "The kind of graphics is vital. What is on the walls are printing errors, paper used for colour calibration in printing machines which are then thrown away. Visual pollution waste pasted to the wall becoming art".